Another book cover designed by me. This book is available at all bookstores…only no one ever buys it! Really liked The ‘we’re talking’ piece……. does it say ‘vote din’?! !… ha ha…… nice work! n thanks for the frank feedback on character design….. i agree it’s too bugs bunny-ish at the moment…..working on developing something definitely more original than this……. very interesting …makes me feel to peep inside the book ! ni-ice. surprised by ‘p v narsimha rao! t> The book is a collection of telegu feminist poetry…rather literally translated by Mr Rao! How far out can you get! Parag> Nice to see you here! Where have you been? hyuck :D:D:D Jedi said it. but interesting cover. you know, hide the name of the translator and it just might sell. the covers are so interested and the crocos so cute! toinks> that’s what I suggested! But the publishers thought that’s the USP! 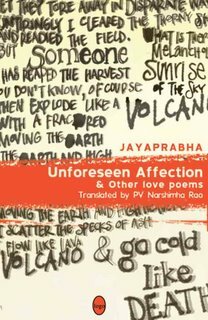 I bought one at The Oxford Book shop when I was in Mumbai in ’08….I discovered it by accident, but it’s one of my favorite books of poetry.